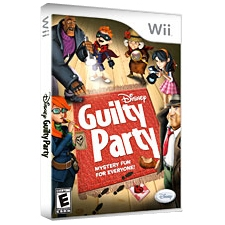 Disney Guilty Party is a fun and hilarious mystery party game, exclusively for Wii console. Friends and family play as the savvy sleuths of the world-famous Dickens Detective Agency to investigate a series of mysteries and identify the guilty party. Explore a variety of mysterious locations - each with a unique twist. The Wii Remote is used to collect clues and interrogate suspects via fun pick-up-and-play minigames. With enough evidence gathered, players can identify the guilty party and crack the case.